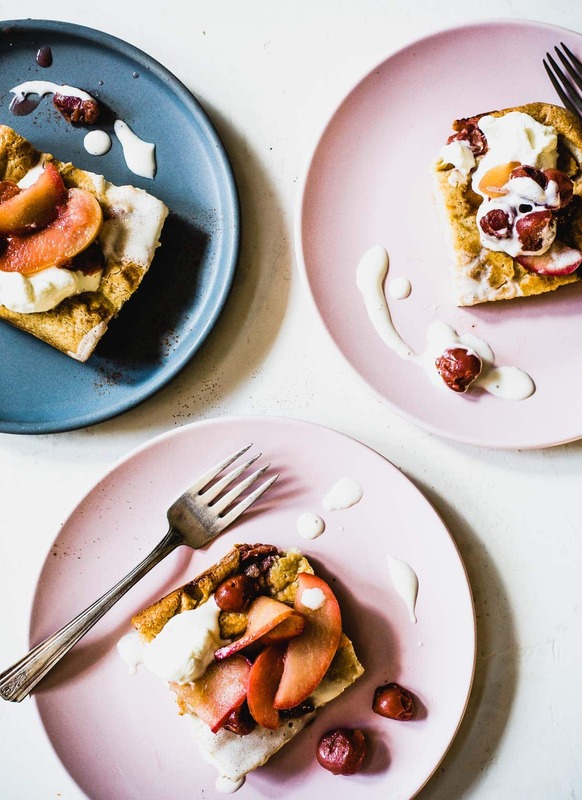 This oven pancake recipe is sponsored by the Cherry Marketing Institute, a continued partner of Heartbeet Kitchen. The idea of pancakes when you’re hosting brunch always sounds great, but then I realize I’ll be flipping cakes and trying to keep them warm while everyone else is relaxing and sipping mimosas. And I want to be sipping mimosas too. It’s a super speedy, all in one, breakfast to make, and even easier to eat. 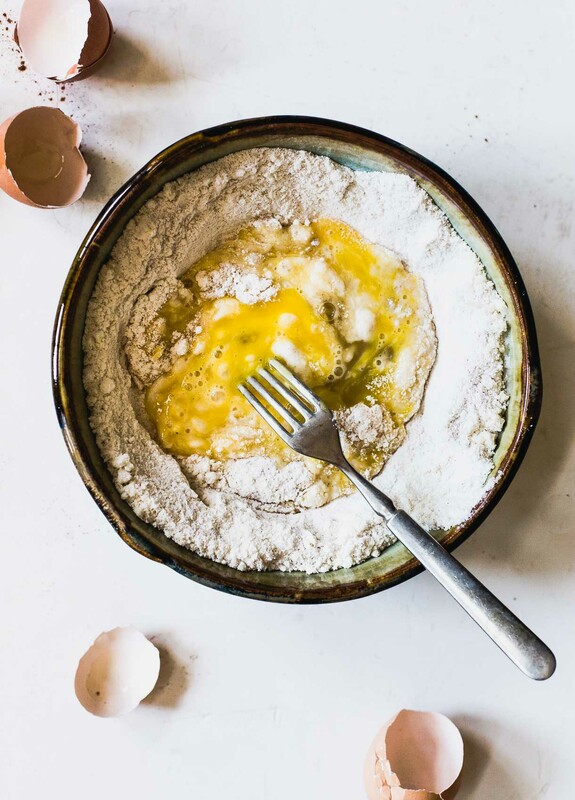 Made from the simplicity of eggs, milk, and almond flour. 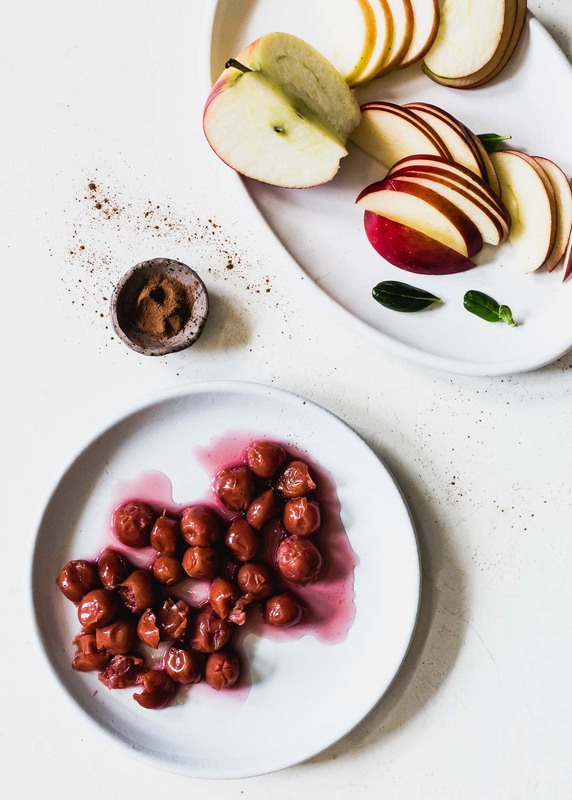 Most of the sweetness comes from the fruit – Montmorency tart cherries and apples for this fall inspired version. You’ll swap a griddle and the stove for a 9 inch baking pan and the oven, and it’ll come out as a toasted, utterly delectable looking pancake. I’d actually describe it most like a pancake-crepe hybrid. Light and airy, with zero chance of drying out. 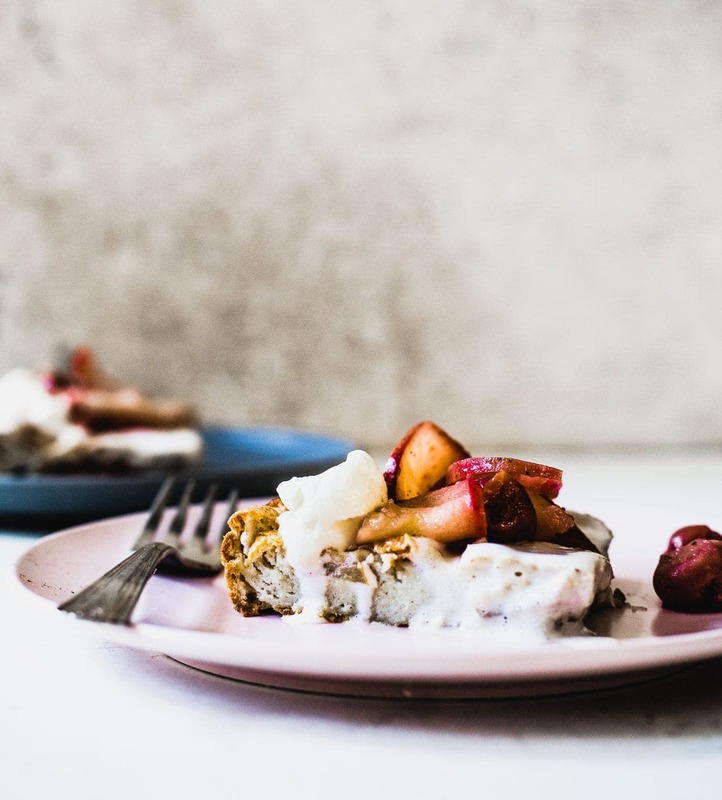 With sweet sautéed apples and juicy tart cherries that bake under the batter and used as a topping, it’s a delicious mingling of summer and fall. One of the things I love about Montmorency tart cherries is that they’re preserved through canning, freezing, or drying. Canned in water and their own juices, which is what I used here, they taste just like they came right off the tree on a hot July day. This oven pancake is gluten-free too! Inspired and adapted from the puff pancake in The Alternative Baking cookbook, I used mainly almond flour and a bit of sweet rice flour (for binding power), and it turned out beautifully. I love the lightly nutty flavor and soft texture underneath the puffy, crackled top. It’s topped with whipped cream, that melts if you add a dollop and eat while it’s warm. I particularly love how it flows into the tiny cracks of the pancake, and adds creaminess to each bite, kind of like maple syrup would do on a traditional stack. 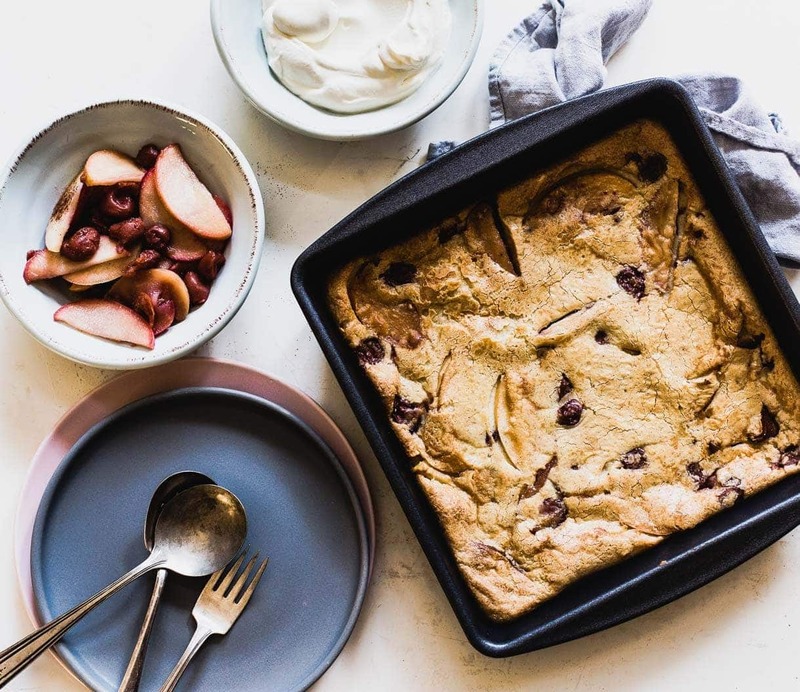 If you make this Tart Cherry & Apple Oven Pancake, be sure to tag me on instagram @heartbeetkitchen, or with hashtag #heartbeetkitchen! In a skillet, melt 2 tablespoons butter. Add tart cherries and apple, stirring to coat. Bring to medium heat, and add sugar, cinnamon, nutmeg, and pinch of salt. Cook for 7-8 minutes until apples are soft and starting to caramelize. Set aside. In a large bowl, stir together almond flour, sweet rice flour, salt, cinnamon, and nutmeg. Whisk in eggs, then cream, then water and vanilla, and maple syrup, until batter is smooth. (Alternatively, use a blender to mix all of this together.) Set aside. Place pan in oven, with 2 tablespoons butter. Let butter melt, then remove and swirl butter around pan. Add 1/2 of the tart cherry apple mixture evenly to bottom of pan. Pour batter over apple mixture. Bake for 10 minutes at 300 degrees F. Then turn up to 350 degrees F and bake for 20 minutes longer, until pancake is cooked through and beginning to brown. Top with fresh whipped cream and remaining tart cherry apple mixture. Adapted from the puff pancake recipe in The Alternative Baker cookbook. Oh, golly- YUMMMM! This sounds so incredibly good, PLUS it allows the cook to have a pleasant, relaxing morning also- instead of standing over the hot stove while everyone else gets to goof off. Here I come, Sunday New York Times Crossword Puzzle!!! Do you think almond/cashew creamer could substitute for the heavy cream? Yes, I definitely think you could substitute non-diary creamer for the heavy cream! Well now that I’ve seen this oven pancake, I literally have no excuse to not make pancakes because I’m too impatient or too lazy to cook individual scoops of batter. Just bake my whole batch of pancake batter, bada bing, bada boom, BREAKFAST. 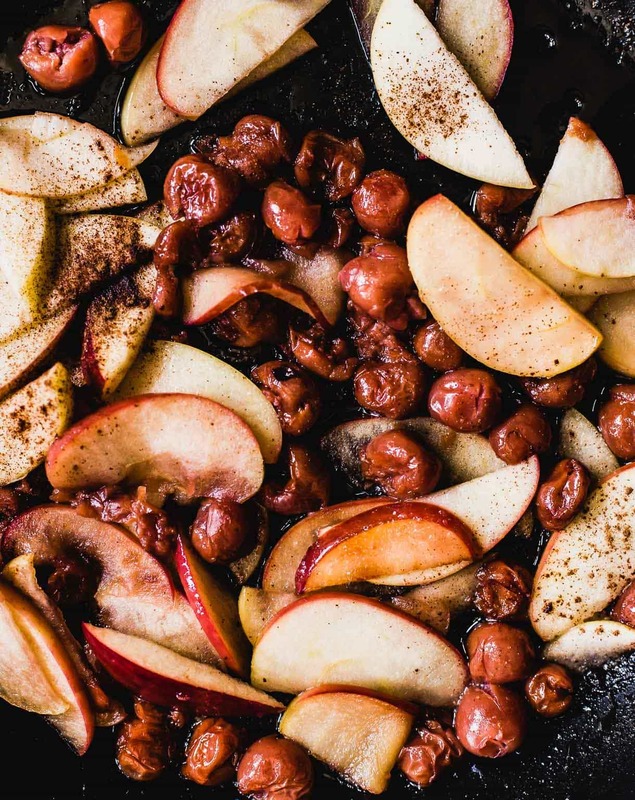 Cherries and apples complement each other perfectly, so it’s no wonder that they’d taste great in your recipe! 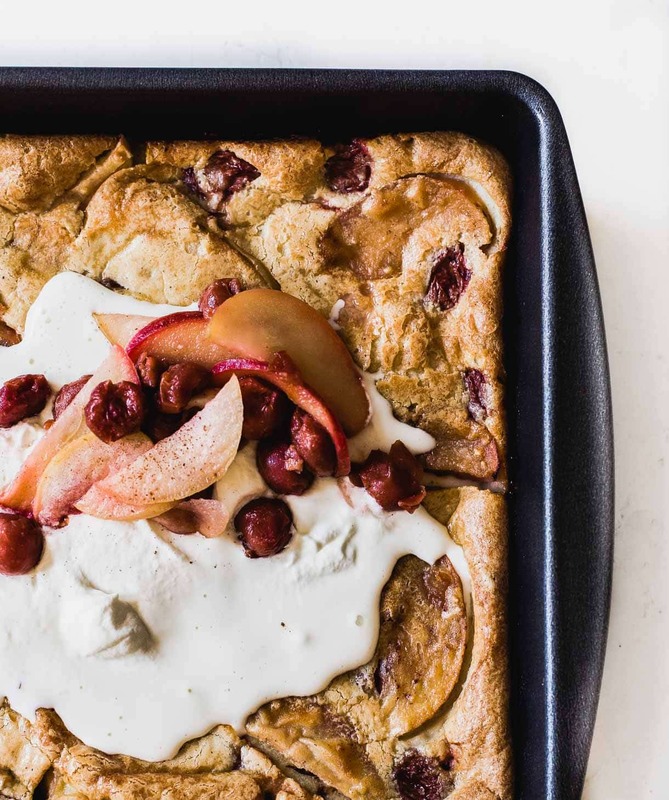 I love how this oven pancake looks so gorgeous but is probably really easy to prepare! This is such a great idea! I love the idea of only having to make one big pancake! Perfect for serving a crowd! 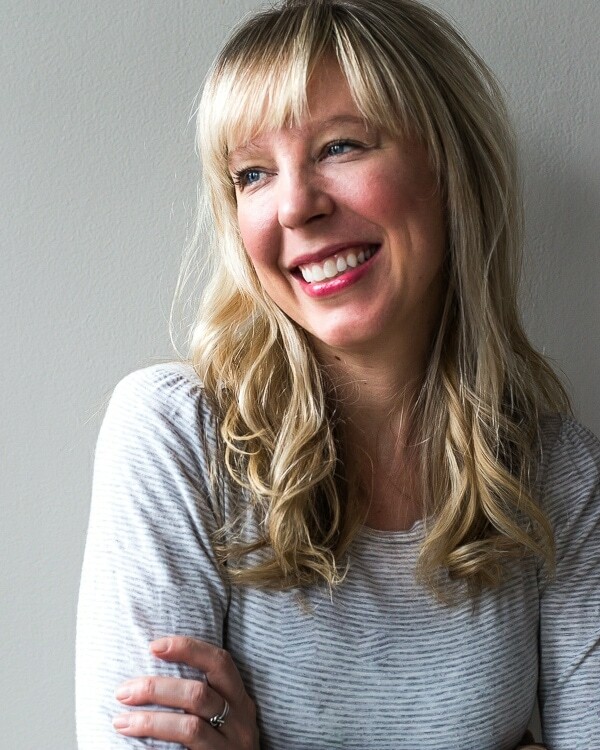 Oh Amanda, this looks too delicious! Agree that baked pancakes > flipping pancakes!